Teach your child that beauty is more than skin deep with the story of Esther. 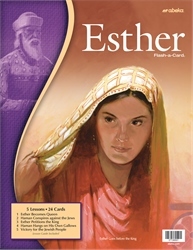 These 5 lessons and 24 picture cards depict Esther becoming a queen to her advocating to save the Jewish people. Included is a detailed teacher guide which gives you content to teach, prompts to use the pictures, and review questions for each lesson. Encourage your child to be bold in the service of the Lord just like Esther.